Comic strip buffs will be out in force on Friday, March 18, when Brunk Auctions hold their Jewelry, Modern & Southern sale. 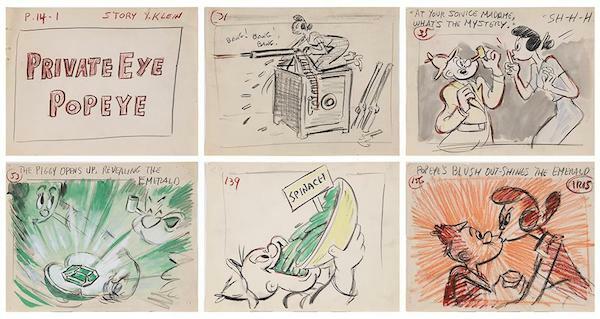 Nestled in among the 254 lots on offer are four sets of "Popeye the Sailor" story board drawings, plus one "Casper the Friendly Ghost" story board. These are extremely rare offerings from the golden age of American animation sure to have collectors licking their chops in anticipation. Elzie Crisler Segar created Popeye in 1929, when he first appeared in the daily King Features comic strip "Thimble Theatre." Although the strip was in its 10th year when Popeye made his debut, the one-eyed sailor with the spinach obsession quickly became the star. Aside from comic strips, Popeye would go on to appear in theatrical and television animated cartoons, and in 2002, TV Guide ranked him #20 on its "50 Greatest Cartoon Characters of All Time" list. The four story boards are all from the 1950s, produced for theatrical animated cartoons under the Famous Studios banner. 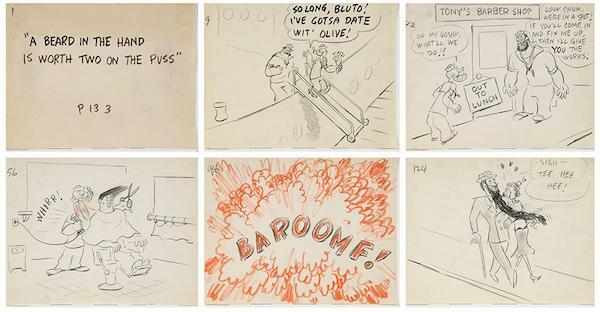 Lot 116 (above), created for an episode titled "Popeye Private Eye," comes in crayon, graphite and watercolor on paper, and features Popeyes pipe, his addiction to spinach, and the love of his life, Olive Oil. Lot 115 is the complete set of story board drawings, including title page, for an intriguingly named episode titled "A Beard in the Hand is Worth Two in the Puss." Featuring Popeyes arch nemesis Bluto, we see the two sailors entangled in their usual battle for Olive Oils heart...with some weird barber shop hijinx thrown in. A quick read of the sales title lets you know there is far more to this sale than cartoon story boards. Brunk Auctions have put together a great catalog here, featuring a broad selection including decorative works, furnishings, jewelry, fine art, and more. 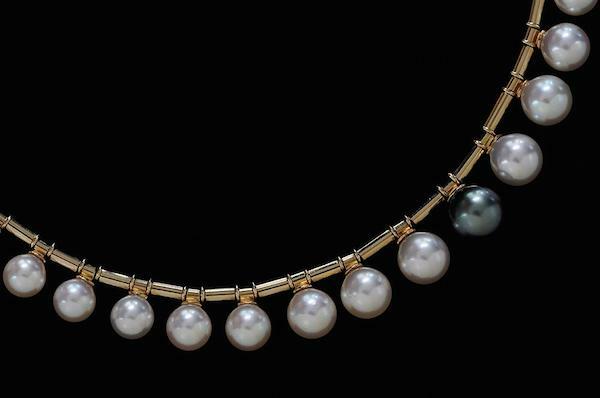 Lot 38, a custom pearl necklace, dazzles with one centered natural Tahitian pearl surrounded by 42 spherical Akoya cultured pearls, and is sure to have its share of admirers. Lot 129 will set the perfect tone the next time you have friends round for coffee. 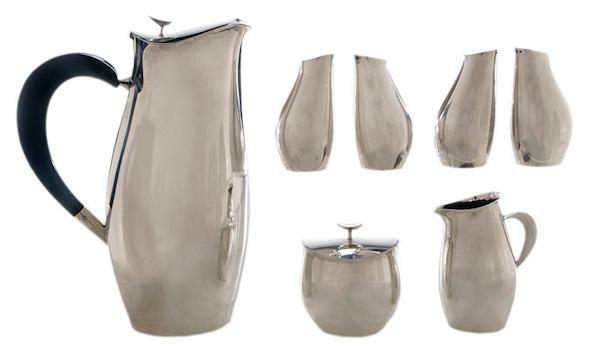 As beautiful as it is practical, this 1950s Towle sterling contour beverage set features a 10 inch pitcher plus a matching lidded sugar holder, a creamer, and two pairs of salt and pepper shakers. Brunk Auctions Jewelry, Modern & Southern sale is set down for Monday, March 18 and contains over 250 lots. Look now at the full catalog.